Receive up to BM$50 by completing this module. BM$ can be used to offset future course fee payments. There's joy in listening to a great tune but nothing beats the experience of playing it for real. Awaken your musical ability as we unlock your potential to groove on the Cajon through our breakthrough classroom approach. Come believing and experience the impossible. The XPerience module is a short 3-week trial class designed for the complete novice to experience and embrace music from within. Be exposed to the Cajon and awaken the power of rhythm in your life. i) interested in picking up the Cajon. ii) unsure of their ability to learn music. We accept registrations from ages 8 and up. However, we strongly advise students aged 8-10 years to meet with our coach to assess their suitability for the course. Call us at 6323 0304 to arrange for an appointment. We will also channel students to classes of compatible age groups whenever possible. What will I achieve at the end of these 3 weeks? i) discovered and experienced essential musical concepts that will form a lasting foundation for further music education. 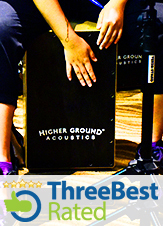 ii) experienced the touch of the Cajon with a variety of rhythms and know if it suits you. iii) played to favourite contemporary pop songs. The program is designed for in-class participation. Take-home practice is not required or expected. However, you are free to purchase an instrument if you wish to have added practice at home. Instrument packages are available when you register online or at the Believer Music Retail Store. I have never seen myself as a musician. Are you sure I will succeed in this course? The one obstacle that limits musicians is fear. This psychological barrier exists even at the highest echelons of the music field. This program is uniquely designed to breakthrough such barriers because musical sense is in everyone. You just need to know how to unlock it. This program will achieve that for you.